Week Eleven of Russia’s Intervention in Syria: A Step Back from the Brink? This has been an amazing week. While last week I concluded that “The only way to avoid a war is to finally give up, even if that is initially denied publicly, on the “Assad must go” policy”. Now it is true that various US officials, including Kerry, did make statements about the fact that Assad need not go right now, that a “transition” was important or that “the institutions of the state” had to be preserved, but of course what I, and many others really meant, was that the US needed to fundamentally change its policy towards the Syrian conflict. Furthermore, since Turkey committed an act of war against Russia under the “umbrella” of the US and NATO, this also created a fantastically dangerous situation in which a rogue state like Turkey could have the impression of impunity because of its membership in NATO. Here again, what was needed was not just a positive statement, but a fundamental change in US policy. There is a possibility that this fundamental change might have happened this week. Others have a very different interpretation of what took place and I am not categorically affirming that it did – only time will show – but at least it is possible that it has. Let’s look at what happened. “As I emphasized today, the United States and our partners are not seeking so-called “regime change,” as it is known in Syria” source. “Now, we don’t seek to isolate Russia as a matter of policy, no” source. The USA announced that it was withdrawing 12 of its F-15s from Turkey, 6 F-15C and 6 F-15E. Now this might not look like much, but these are highly symbolic aircraft as they are the aircraft which were suspected of “covering” for the Turkish F-16s which shot down the Russian SU-24. The F-15Cs, in particular, are pure air-to-air fighters which could only have been directed at the Russian aircraft in Syria. Of course, the US declared that this was a normal rotation, that it has been an exercise, but the bottom line is here: while NATO Secretary General Stoltenberg had promised to reinforce the NATO presence in Turkey, the US just pulled out 12 of its top of the line aircraft. So not only do the Russians now have the means to channel their intelligence about the collaboration between Daesh and Turkey to the UNSC, but the Secretary General will now produce a report based, in part, on this intelligence. This is all very, very bad news for Ankara. First, the downing of the Russian SU-24 is becoming a major liability. The Russians have immediately claimed that this was a carefully planned and cowardly ambush, but now top western experts agree. This is very embarrassing, and it could get much worse with the deciphering of the flight recorders of the SU-24 (which the Russians have found and brought to Moscow). The picture which emerges is this: not only was this a deliberate provocation, an ambush, but there is overwhelming evidence that the Turks used the information the Russians have provided to the USA about their planned sorties. The fact that the Americans gave that information to the Turks is bad enough, but the fact that the Turks then used that information to shoot down a Russian aircraft makes the US directly responsible. The USA is also responsible by the simple fact that there is no way the Turks could have set up this complex ambush without the USA knowing about it. Now, it is possible that some in the US military machine knew about it while others didn’t. This entire operation sounds to me like exactly the kind of goofball plan the CIA is famous for, so maybe Kerry at State or even Obama did not really “know” about it. Or they did and are now pretending like they did not. Whatever may be the case, the US is now obviously trying to “off-load” this latest screwup on Erdogan who himself is trying to off-load it on his Air Force chief. What is certain is that the plan failed, the Russians did not take the bait and did not retaliate militarily, and that now the political consequences of this disaster are starting to pile up. As for Erdogan, he wanted to come out of this as the Big Pasha, the tough man of the region, but he now looks like an irresponsible coward (Putin ridiculed how the Turks ran to NATO as soon as the Russian SU-24 was shot down when he said: ”they immediately ran to Brussels, shouting: “Help, we have been hurt.” Who is hurting you? Did we touch anybody there? No. They started covering themselves with NATO.”). Even the US and Europe are, reportedly, fed up and angry with him. As for the Russians, they seem to believe that he is a “Saakashvili v2” – a guy with whom there is nothing to discuss and whom the Kremlin considers as politically dead. Second, look at Syria. Even under maximal pressure, the Russians did not yield or show signs of hesitation but did the exact opposite: they more than doubled their presence, brought in heavy artillery systems and even floated the idea of opening a 2nd major airport in Syria (this intention was later denied by Russian officials). For the Americans this meant something very simple: while the Russians are much weaker in Syria than the USA, they were clearly undeterred and were not only holding their ground, but digging in. In other words, they were ready for war. I want to believe that the various warnings issued by many, including myself, might have contributed to convince the US analysts that the Russians were really ready to fight. First, there is Peter Lavelle who on his RT show CrossTalk has been warning about the path to war for literally months now. But there have been many others, including Pepe Escobar, Paul Craig Roberts, Alastair Crooke, Stephen Landeman,Stephen Cohen, who were sounding the alarm and warning the Empire that Russia would not ‘blink’ or ‘back down’ and that war was a very real, possibly inevitable, danger (you can see some my own warnings about that here, here, here and, of course, in my last week’s column). I know how the intelligence process works and I believe that such a loud chorus of warnings might well have played a rule in the US decision to change course, if only for the immediate future. As I have stressed over and over again, the “tactical-operational contingent of the Russian AirSpace forces in Syria” (that is their official name) is small, isolated and vulnerable. Syria is stuck between NATO and CENTCOM and the US can, if needed, bring an immense amount of firepower into Syria and there is nothing the Russians could do about that. 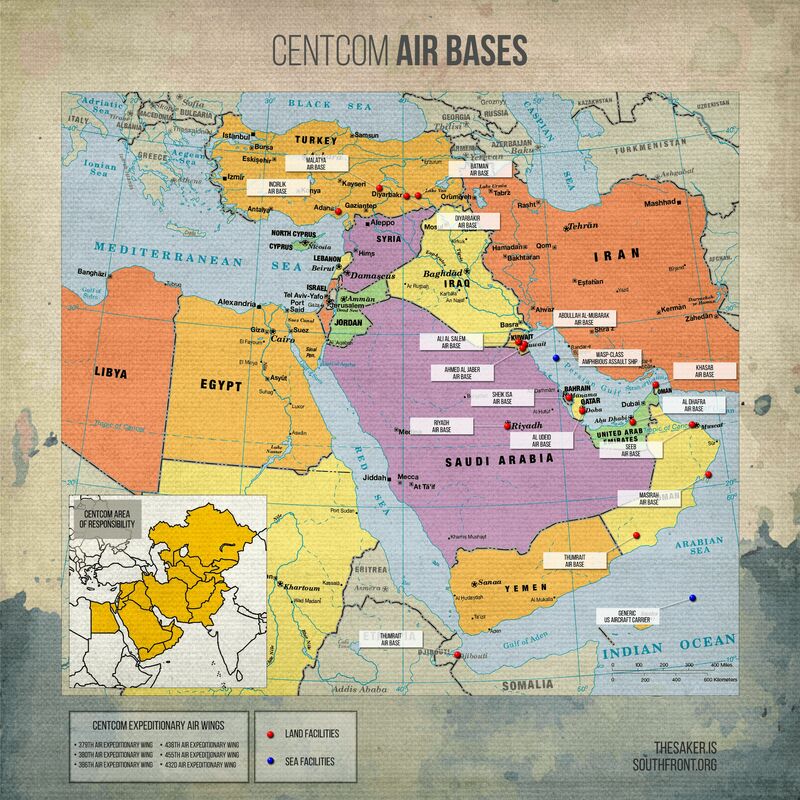 See for yourself how many air bases the US has in CENTCOM and Turkey by clicking here: http://imageshack.com/a/img908/9391/B61WCG.jpg (high resolution, 7MB image created by SouthFront). But there is one thing even a small force can do: become a “tripwire” force. Regardless of the limited capabilities of the Russian task force in Syria, it was large enough to be considered a “tripwire” force – one which attacked would result in a full-scale war with Russia. If the Americans had any doubts about that, they were instantly dispelled when they heard Putin officially declared that “I order you to act very extreme resolve. 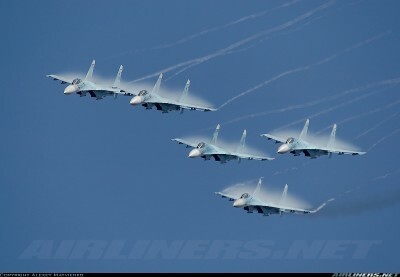 Any targets that threaten Russia’s group or our terrestrial infrastructure is to be immediately destroyed”. The combination of all these factors was, apparently, sufficient to convince the US to step on the breaks before things really got out of hand. Again, I am not affirming that this is what took place, but I want to believe that I am correct and that somebody in the USA finally understood that war with Russia was inevitable if the USA continued on the same course and took the decision to stop before it was too late. If this is really what happened, this is extremely encouraging and very, very good news. While stupidity and insanity, not to mention outright evil, are definitely present in the AngloZionist Empire’s top command, there is always the possibility for decent and sane men to do the right thing and try to stop the crazies (like Admiral Mike Mullen did when the Neocons wanted to start a war with Iran). Some people in Europe and the US repeatedly said that our interests would be respected, and that our [military] base can remain there if we want it to. But I do not know if we need a base there. A military base implies considerable infrastructure and investment. After all, what we have there today is our planes and temporary modules, which serve as a cafeteria and dormitories. We can pack up in a matter of two days, get everything aboard Antei transport planes and go home. Maintaining a base is different. Some believe, including in Russia, that we must have a base there. I am not so sure. Why? My European colleagues told me that I am probably nurturing such ideas. I asked why, and they said: so that you can control things there. Why would we want to control things there? This is a major question. We showed that we in fact did not have any medium-range missiles. We destroyed them all, because all we had were ground-based medium-range missiles. The Americans have destroyed their Pershing ground-based medium-range missiles as well. However, they have kept their sea- and aircraft-based Tomahawks. We did not have such missiles, but now we do – a 1,500-kilometre-range Kalibr sea-based missile and aircraft-carried Kh-101 missile with a 4,500-kilometre range. So why would we need a base there? Should we need to reach somebody, we can do so without a base. It might make sense, I am not sure. We still need to give it some thought. Perhaps we might need some kind of temporary site, but taking root there and getting ourselves heavily involved does not make sense, I believe. We will give it some thought. I find that reply quiet amazing. Can you imagine a US President actually thinking that way and openly saying it? Putin is quite obviously making fun of the so-called “experts” who have been telling us for years how much Russia cared about a base in Tartus and who now tell us that the airbase in Khmeimim is the next “forever base” for Russia not so much to protect Syria but to project Russian power. It turns out that Russia has no interest and no desire for any such costly power projection: “ Should we need to reach somebody, we can do so without a base”. By the way, this translation is incorrect. What Putin really said was “Если кого-то надо достать, мы и так достанем”. The word “dostat’” is translated here by “reach” but I would translate it by “get” meaning “if we need to get somebody (in the sense of “strike at somebody”) we can already do that (i.e. without a base)”. This was most definitely a veiled threat even if the official translation does not render it accurately (and yes, a supersonic and stealthy cruise missile with a reach of 4’500km does allow Russia to ‘get’ anybody anywhere on the planet, especially when delivered by aircraft with a 12’000km flying range). When western leaders and expert assume that Russia is about building bases abroad they are really only projecting their own, imperial, mindset. I have said that over and over again: Russia has no intention of ever become an empire again simply because being an empire is bad for Russia. All Russia wants is to be a truly sovereign state and not to be a colony of the AngloZionists, but she has no intention whatsoever of becoming an “anti-USA” or a “Soviet Union reloaded”. Hillary can scare herself at night with nightmare of Putin rebuilding the USSR, but there is no constituency in Russia for such a plan. Russia wants to be free and strong, yes, but an empire, no. It is quite amazing to see how western leaders and experts project their own mindset unto others and then end up terrifying themselves in the process. It’s quite pathetic, really. In conclusion I will just add that it is quite likely that the focus will shift back to the Ukraine again. Not only is the Ukraine hours away from an official default, but the Ukronazis are openly threatening Crimea with, I kid you not, a “naval blockade”! Considering the lack of US and NATO enthusiasm for Erdogan’s shooting down of the Russian SU-24, I very much doubt that anybody in the West will be happy with that goofy idea. So between the economic collapse, the political chaos, the coming winter and the Nazi freaks and their crazy plans to fight Russia, there is a pretty good chance that the next flashpoint will be in the Nazi-occuppied Ukraine again. I doubt that the US has the “mental CPU power” to deal with both crises at the same time, at least not in a sustained and energetic manner. That, again, is good news – the Empire is over-committed and overstretched and that is typically the only situation when it is willing to compromise. We shall soon know if my very cautious optimism is warranted or not.